"I've arrived. Reborn as Kusanagi. The destroyer of all living creatures. I am death..."
μ-No.12-, commonly abbreviated as Mu-12 and known as both Kusanagi and the Sword of the Godslayer is a Boundary Interface Prime Field Device, Murakumo Unit, and the alter form of Noel Vermillion. Originally birthed in the 5th Hierarchical City of Ibukido, Mu was a depressed and murderous Prime Field that remained as a repressed part of Noel's soul. This part of her has disappeared with time, and her powers are used by Noel in times of need. 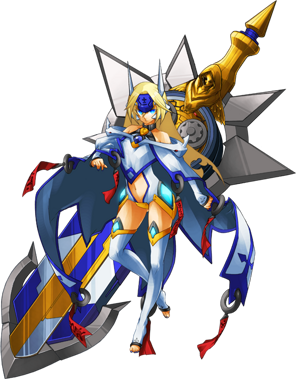 Mu first appeared as the final boss of BlazBlue: Continuum Shift, being unlocked once the true ending of story mode is completed. Mu-12 is physically identical to her original form, Noel Vermillion. 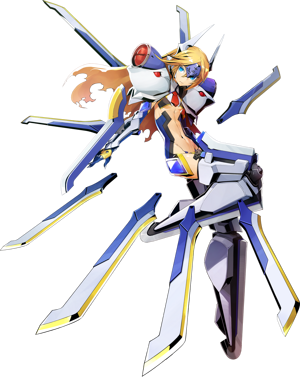 In BlazBlue: Continuum Shift, her eyes have dilated pupils and are sometimes depicted as glowing a bright blue, but this trait disappears in the next two games. When out of combat, Mu wears a cloak very similar to Nu's, but with a large blue jewel and harness attached to a small metal collar in place of Nu's much larger collar. Her jumpsuit is white, has slightly larger gloves, exposes her lower torso, and lacks pants, which she replaces with long white leggings. Her jumpsuit also has glowing blue jewels set in golden frames on her hips, which are also present on top of her leggings. The metal piece over her crotch is similarly golden. In place of Nu's seithr regulator, Mu wears a metal headpiece with her variant of the Prime Field Device symbol engraved into it and stiff, horn-like antennae, an article of clothing which she continues wearing in combat. Mu's battle gear is similar to a mecha, just like her “sisters”, but with several key differences. She lacks a bodysuit, instead wearing a small blue, gold, and black garment which only covers the sides of her torso, her hips, and her crotch, exposing her back and front. Her gear has enormous blue and white shoulderpads with seithr regulators built into them, as well as a third, smaller regulator built into a gray metal object on the back of her neck. Under the shoulderpads, she wears a collar similar to that of a dress shirt, with a short red necktie. She has long blue gloves with golden metal guards on the hands, and metal mounts on her forearms for her blades, identical to Nu's and Lambda's. Her bladed leg armor is also identical to theirs. Although she appears calm and collected, she is actually quite lonely. Moreover, she is shy, and is bad at forming close personal relationships. She is good at fighting, but outside of that she is unskilled. Her cooking boasts the ability to kill people. Mu originally existed as a separate entity from Noel. Deep down, Noel has hidden feelings about herself which manifested into "Mu". It is unknown if these feelings are truly Noel's or if they belong to the original Mu. Regardless, this dark side that inhabits her soul only desires the absolute annihilation of the world and the Amaterasu Unit. Anyone who stands in her way is a threat that she will coldly execute without remorse or hesitation. In some moments, there was a glimpse at insanity as she manically laughed while indulging in her power. Underneath the mechanical coldness or moments of madness, Mu is lonely and feels isolated from the world. Her hatred for the world is only matched by her hatred for herself. Mu only considers herself a doll - something less than human. Thankfully, these feelings and the personality of Mu has disappeared and she has come to be an accepted side of Noel. Mu now has Noel's personality and uses her name. Official descriptions of Mu's personality are identical to Noel's to reflect this. Using the fully awakened power of the Godslayer, Mu is one of the most powerful entities to have ever existed. As the perfect fusion of a portion of Azure with a Boundary Interface Prime Field Device, Mu boasts power stronger than that of the Black Beast. 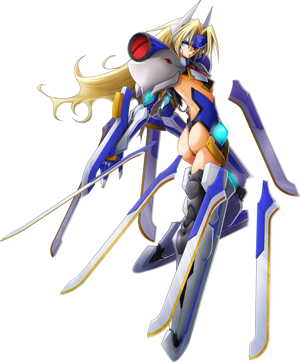 She can freely enter the Boundary and is capable of fighting off both Jin and Ragna the Bloodedge at the same time. Part of her combat power lies in the intricate usage of her Nox Nyctores - Lux Sanctus: Murakumo. By using Murakumo, Mu has the power to overwhelm opponents with its myriad of blades. In gameplay, Mu has the Drive Steins Gunner. When pressed, a small device will be launched which shoots a thin projectile at the opponent after a brief charge time; holding down the button will delay the shot, but in turn, make the beam thicker and deal multiple hits. Most of Mu's moves keep her opponent at bay, stopping them in their tracks, although she can boast good close-range pressure and can use Origin to get out of opponent's pressure. Mu uses these Steins in lore as well, with their power being able to easily pierce people's bodies. Mu's only weakness is her own doubts as Noel. As she is Noel herself, she also has the ability to wield the Arcus Diabolus: Bolverk and phase through enemy attacks. She is the ultimate Observer who can make anything reality by just recognizing it as such. No one has stood on an even ground with Mu without having sustained life-threatening injuries - Ragna himself was shot by one of her Steins and lost his left arm to save Noel's soul from her transformation into the original Mu. Even a victory against Mu means having to make large sacrifices. It appears that Mu, when under the influence of her hatred, is far stronger than when Noel is in control. The Successor of the true Azure and the awakened form of Noel. The ultimate Boundary Interface Prime Field Device. She was the "Sword of the Godslayer Kusanagi," the only one able to destroy the Master Unit that exists in the Boundary, but with the help of Ragna, Noel was able to retain her self-identity. So, to save her best friend, she asks Rachel to teach her how to control this power. The Successor of the Azure and the 12th Prime Field Device, as well as the true form of Noel Vermillion. She awoke in Kagutsuchi as the "enemy of the world," and was attacked by her friends one after the other. In order to discover the true meaning behind this phenomenon, she begins to act. The Eye of the Azure - this is Noel's form when she consumes the eye and becomes the Successor. Her ultimate evolution as a Prime Field Device. Since she was forcibly awakened as the Sword of the Godslayer, Kusanagi, her old memories are brought back to the surface again, turning her into a much more aggressive version of herself. μ-No.12-, the only entity able to destroy the Master Unit in the Boundary, is saved by Ragna, and regains her consciousness as Noel. With her consciousness regained, she seeks the help of Rachel, hoping to wield her newfound power and save her friend Tsubaki from the Imperator's curse. The form of Noel Vermillion after she awoke to the power of the "Azure" as its Successor. The only one who can destroy the "Sankishin: Amaterasu Unit" that exists in the Boundary. The mobile card game Mabinogi Duel features μ-No.12- as a playable card. In Dead or Alive 5 Last Round, Phase 4 has a DLC collaboration costume based on Mu's outfit. In the mobile game Girls' Frontline, Mu is a costume for Noel, being a playable unit. The MMORPG Phantasy Star Online 2, by SEGA, features Mu's outfit, hairstyle, voice and weapon as customization for the player character (only female). In the BlazBlue 10th Anniversary Character Poll, Mu placed 35th out of the 84 candidates, tying with Valkenhayn R. Hellsing. She scored one place above Carl Clover and one place below Iron Tager, having been beaten by one point. She had 564 votes. Most of Mu's moveset is named after objects and deities in Shinto mythology. Mu's original birthday is Christmas Day. Her birthday for when she was reborn is January 7th, and official illustrations celebrate this. Mu shares her English voice actress, Cristina Vee, with Noel, Saya, Lambda-11, and Nu-13. Mu is the first character that can be unlocked by finishing the main story of a game, also being the first unlockable character in the series. She is unlockable in BlazBlue: Continuum Shift by finishing the True Ending, but can be bought as DLC for a cheaper price than usual instead. In every game since, she is part of the starting roster. Distinct from the other two unlockable characters, Kagura Mutsuki and Susano'o, Mu is the only unlockable character who is not playable in the main story mode of the game they debuted before being unlocked. In Continuum Shift and its revisions, Mu is the only playable character without a story mode nor an arcade mode. Originally, Mu was not a part of the Arcade version of BlazBlue: Chrono Phantasma. It was eventually updated with additions of Mu, Nu, and Izayoi, with all three being part of the starting roster for the console version. The crest in the background of the Continuum Shift series of logos is Mu's.